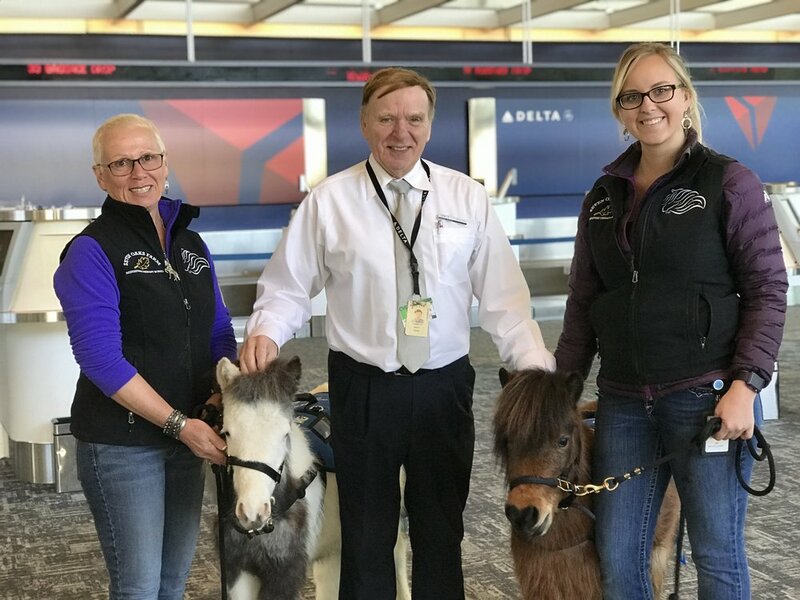 Some of the most frequent questions we are asked are, “Would my horse make a good therapy horse,” and “How do you evaluate a horse for therapy?”. As easy as these questions may sound there is NO easy answer. You may ask yourself, “why is it so hard to answer such simple questions?” The answer will vary for each individual horse and its handler. The experiences and backgrounds of each horse vary greatly, as does the experience of each handler; it isn’t safe or logical to say that there is a set of rules to follow. Just like you, I am in love with horses and find it hard to resist a new horse. The personality of any horse away from it’s herd and normalcy is harder to predict, and could easily change when in a new handler’s hands. Good breeders will keep the integrity of the miniature horse breed, have established personality and size consistency. I pick a horse because I like his/her coloration, I also have a list of reputable breeders who I work with who know the personality I look for. There are pros and cons of choosing a horse of any age for your program. We have brought in horses like Annabelle and had her out doing therapy visits within 2 weeks of being born. Others like Denver came to the farm around age 4 and after a bit of desensitization, he was doing therapy visits after 6 months. You need to find a horse that works with your personality. If you can form a trusting relationship with a horse, age doesn’t matter. They are so irresistible! Okay, now that we have that established… A benefit of choosing a younger horse is the small number of handlers they have experienced. You will be their primary trainer and you know a lot of what they have been through. When they are young, babies are typically easier to handle and train. 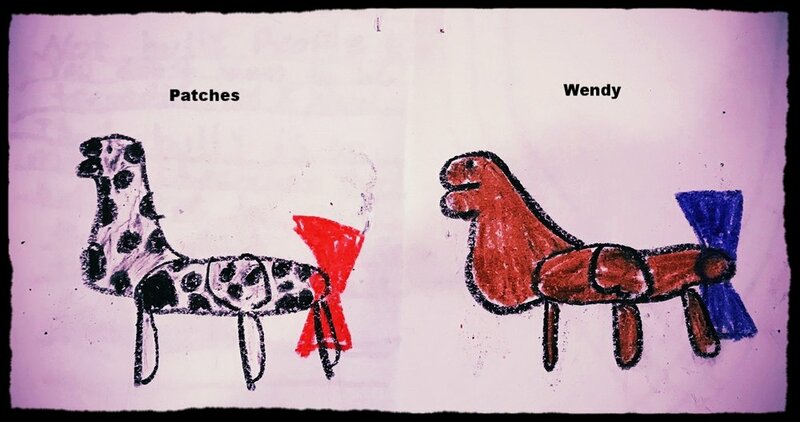 Remember, horses go thru a stage of "terrible twos”. Trust your training, don’t let temporary habits become normal behaviors. A benefit of choosing an older horse is the maturity level. You can see more of their permanent personality. You are not the only person who has trained this horse, simply put - old habits die hard. A mature horse has history, various handlers and maybe even different disciplines. Do you best to find out how that previous training has influenced their handling and disposition now. Again, trust your training and be consistent. Bottom line, a horse that is well trained with a tender hand will create a lasting bond. We use mares and geldings equally in our program. I don’t prefer one over the other, and some of my best teams are mare/gelding duos. I do take into consideration who I put into the trailer. Some horses will react differently on a visit depending on who is with them. A lot of my time is spent watching the herd dynamic, who allows who to eat by their side. This determines who I can pair together. We always try to partner horses with their friends or other horses from their micro-herd to make the visit as stress-free as we can. This is a sign of how the horse will respond under stress and would require a lot of training to change that response. There is no guarantee the horse will ever improve. It is worth mentioning, out of aggression is a very different response than playfulness or mouthiness. Horses play games with each other by nipping at the others’ front legs. There is a noticeable difference between a horse bite and a playful nip. You could check off all your “boxes” and find a horse that seems fit for therapy but doesn’t enjoy the work he/she does. That’s okay! 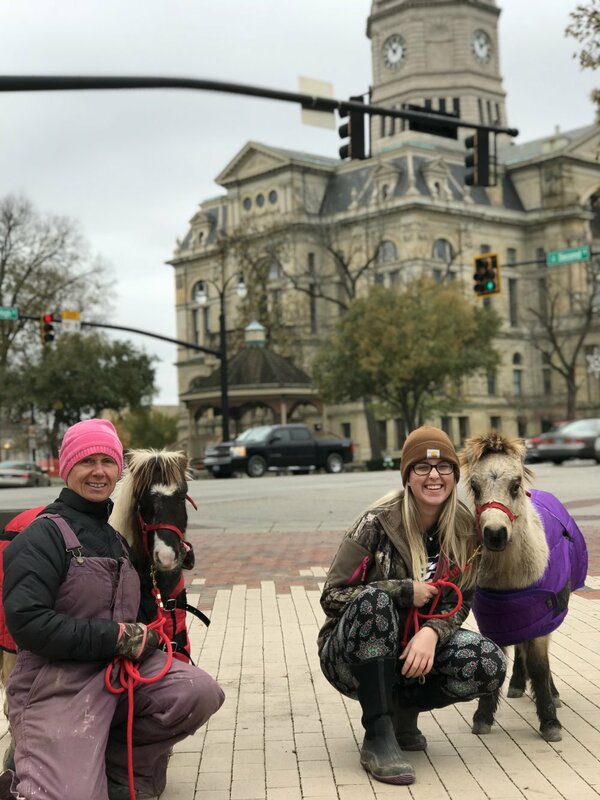 Therapy work isn’t for every miniature horse. Our goal is to place the horse in a program it thrives in - and sometimes they’re just beautiful lawn ornaments with excellent ground work waiting for their forever home. Our seminars are very popular and have been given great reviews by those who have attended. Since so many of you have asked for addition dates we have decided to put together a very special set of classes that will be held only here in Ohio. We are offering a specially designed class that will combine Level 1 and Level 2 with hours of hands on training and participating in an actual visit. These seminars will be held here at our farm in Hamilton, Ohio. The classes will be small so that each student gets plenty of personal attention and the ability to practice what you have learned. 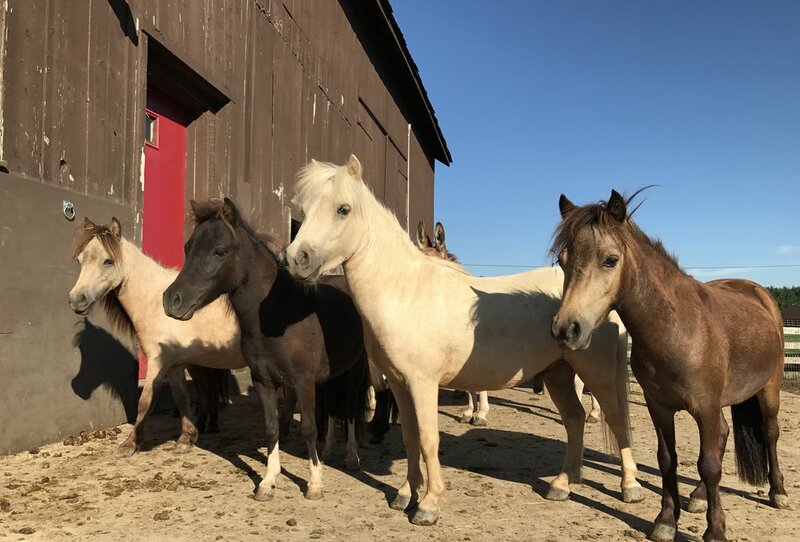 The classes are limited to 6 students and you will be able to work with our horses for all the hands on portion, you will also be able to experience our specific training methods for both horses and handlers. While you are here with us we will do an actual visit, you will be able to experience first hand what its like with our trained handlers by your side. You will walk thru all the steps necessary for preparing the horses for a visit, going on a therapy visit and a post visit evaluation. Our desire is for you to get a full experience in animal assisted therapy and gain as much experience as you can. This portion of our seminars is key to understanding our philosophy to our program and how we approach all the training we do for horses and handlers. It is also created as a road map to help you walk thru the maze of question you might have in regards to insurance, setting up a visit, becoming a 501C3, training your horse, choosing a horse, becoming a handler, finding good products and a whole host of other needs. The Level 1 seminar will include a study guide you can take home that will contain pages and pages of all the information discussed in the lectures. The guide will allow you to follow along and take notes as well. we cover Level 1 Friday evening and into Saturday. This course is designed to take all the information you gained in Level 1 and put it into practice. This portion of the seminar is hands on and will walk you thru the steps of choosing a horse, training your horse and preparing for the different levels of registration. It will also give you practical guidance when it comes to handling your horse for various types of visits. Both of these courses are key to our program and build upon each other. Taking these seminars will allow you to register your horse through our program free of charge. Level 2 will be covered Saturday with a visit for you to participate in and ending Sunday with more training and one on one training. 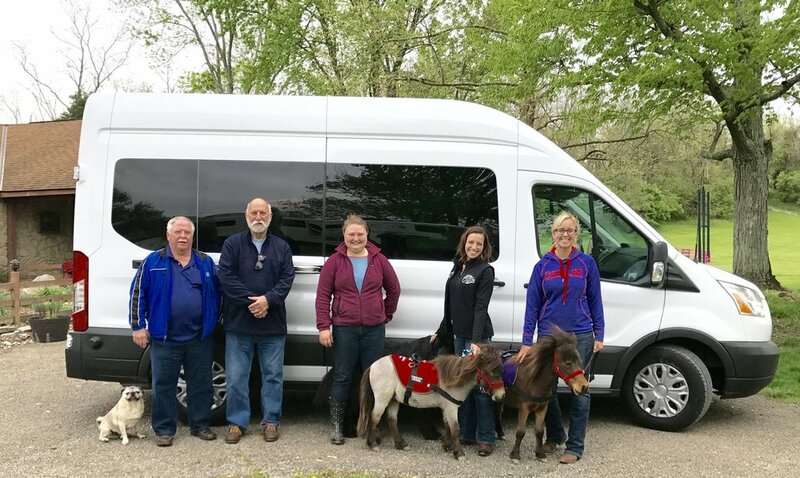 We are excited to share our experience and expertise with those who are desiring to learn more about animal assisted therapy with miniature horses. We would love to have you participate as an individual or as a group. If you think this experience is for you or have interest, please contact us for further details.